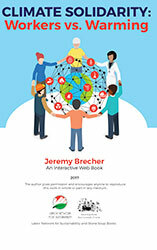 By, Jeremy Brecher, Published by Labor Network for Sustainability and Stone Soup Books, review originally published on labor4sustainability.org. Download CLIMATE SOLIDARITY: WORKERS VS. WARMING free! Workers have no greater interest than to prevent the destruction of the earth’s climate on behalf of themselves and their posterity. But workers often act as an organized force to oppose climate protection measures in the name of their interests as workers. How is such a paradoxical state of affairs possible? How did we get in such a state? How can we change it? How can the working class reorganize itself to fight for climate protection? Climate Solidarity: Workers vs. Warming proposes answers to these questions. Climate Solidarity presents a vision for the labor climate movement. It offers a comprehensive and at times provocative view of the past, present, and future of organized labor and climate change. It provides a substantive analysis for leaders and activists in the labor climate movement. It presents a well thought out, historically informed analysis both of climate change and of organized labor. Climate Solidarity will be read and discussed by those who will shape labor’s response to the climate crisis. 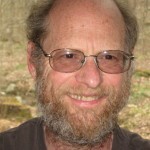 Jeremy Brecher is the author of more than a dozen books on labor and social movements, including the labor history classic Strike!, recently published in an expanded fortieth anniversary edition by PM Press. Climate Solidarity: Workers vs. Warming is part of Brecher’s Climate Insurgency Trilogy, along with Climate Insurgency: A Strategy for Survival and Against Doom: A Climate Insurgency Manual. The Introduction to Climate Solidarity, “Climate and Work,” poses the paradox of workers producing the greenhouse gases that are producing catastrophe for us and future generations. Chapter 2, “The World Order of Climate Alienation,” describes the features of the modern world order that helped create and perpetuate climate alienation, including the nation state system, private property, markets, wage labor, and dependence on fossil fuels. It demonstrates how these features can lead workers and our organizations to pursue short-term particular interests at the expense of our long-term common interest in a sustainable, climate-safe planet. It shows how these same features render workers largely powerless to protect the climate should we wish and choose to do so. It explains how short-term particular interests and powerlessness interact to produce climate alienation. It concludes with a broad outline of how these features must be changed to make effective climate protection possible. Chapter 3, “Worker Movements,” describes the ways in which workers have come together throughout modern history to act on common interests. It shows how worker actions have been rooted in patterns of mutual solidarity, self-organization, and challenge to authority. It describes how worker solidarity, organization, and action have often been restricted to limited groups and objectives. It indicates how those restrictions have limited the power of workers to influence our conditions of existence. And it tells how those limits have often been overcome in new forms of collective action. Chapter 4, “Organized Labor and Climate Protection,” describes how the tension between the apparent short-term interests of particular groups of American workers in particular climate-destroying activities and workers’ common interest in climate protection have been expressed in two major trade union statements on global warming and in the controversy over the Keystone XL pipeline. Chapter 5, “The Emergence of Climate Solidarity,” shows many ways in which American workers are expressing our common interests in climate protection and finding ways to act on them. Chapter 6, “A Climate-Protecting Workers’ Movement,” explores how workers could move beyond short-term special interests in climate-destroying activities to develop broader solidarity and self-organization through the struggle to protect the Earth’s climate. Chapter 7, “A Worker Climate Action Plan,” proposes a program of social change that workers need to impose on those in authority to eliminate climate alienation. Chapter 8, “Climate Solidarity vs. the Alienation of Labor,” sums up the central role of worker climate protection in both protection of the earth’s climate and in the self-liberation of workers from a destructive world order.